Estihdaaf turned the UAE 2000 Guineas into a procession as he ran away with the Group Three contest on dirt to be the highlight of a four-timer for Godolphin at Meydan. Taking trainer Saeed bin Suroor’s record haul in the race to seven, the son of Arch was soon in front despite a slow start. With jockey Christophe Soumillon setting the fractions, Estihdaaf had too much toe for Walking Thunder and crossed the line five and a half lengths to the good. Bin Suroor said of the three-year-old: “He improved from his run last time when he finished second. We thought the dirt would suit him because of his breeding. “I told the jockey before the race to jump and be handy with him as he does when he works well in the mornings. “He went forward with him and he won well. Charlie Appleby supplied Godolphin’s other three winners through Dubhe, Nordic Lights and Mubtasim, all ridden by William Buick. Dubhe led a furlong and a half out in the two-mile Al Naboodah Honeywell Partnership Handicap as his stamina kicked in to score by four lengths from bin Suroor’s Red Galileo to give Godolphin a one-two. 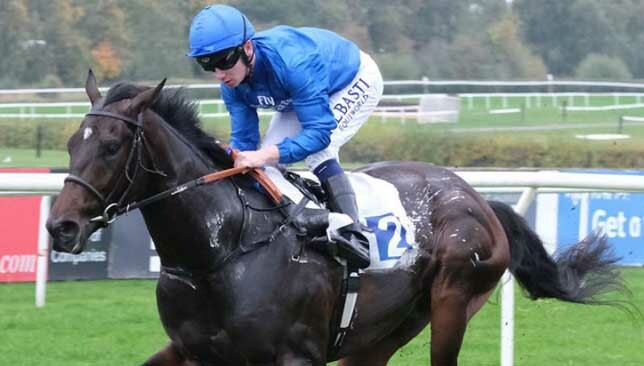 “We were hopeful that Dubhe would cope with the step up to two miles – he has been showing all the right signs and he has the pedigree to stay it,” Appleby told www.godolphin.com. “We were a bit disappointed with his first start of the year, but he just does himself a bit too well and takes a bit of work. “He is not the most exuberant worker at home and coming to the races helped him strip a bit fitter – he definitely came forward for the race. Nordic Lights (11-4) made most of the running as he took the Al Naboodah Travel Handicap by two and quarter lengths from another bin Suroor inmate, Desert Fire. “We tried to eliminate the preliminaries as much as possible which helped and coming back to nine furlongs suited,” said Appleby. “It was a similar run style to the 10 (furlongs) last time, but he got caught late on there. We were confident coming back to the nine he’d have the pace for it and be able to see it out a bit longer. “We saw at the post he gets himself worked up. We try to keep the lid on him for as long as possible. We were allowed to take him down early and keep him as calm as possible. Mubtasim overcame a wide draw to comfortably land the Al Naboodah Cargo Handicap from Poet’s Society with David Marnane’s Irish raider Freescape running a big race in third place. 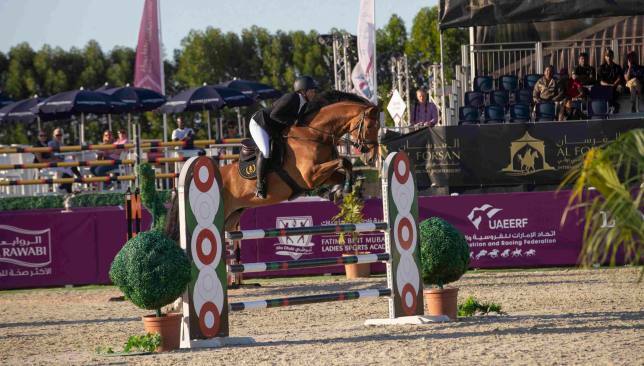 The sixth edition of the FBMA International Show Jumping Cup kicked off on Thursday, as the Al Forsan International Sports Resort gets set to host three days of intense competition and talent. Welcoming 166 riders from 28 counties, the trophy winning commenced as the winners of the first three categories were announced in Abu Dhabi. In attendance was HH Sheikha Fatima Bint Hazza Bin Zayed Al Nahyan, Chairwoman of Fatima Bint Mubarak Ladies Sports Academy, President of the Abu Dhabi and the Al Ain ladies clubs. She said: “It has been a delight being here today, witnessing the opening of the sixth edition of this incredible Show Jumping Cup. The action got under way with day one seeing a total of five categories compete. All events are ‘Concours de Saut International’ (CSI), in line with a ranking system for international show jumping competitions. The day began with a CSI Children’s class (CSICh-A) for riders aged 12-14, which saw eight riders compete. The first category was won by local talent Abdullah Hamad Ali Al Kirbi with a time of 59.40. Second and third places went to Syria’s Layth Ghurayeb and Emirati Saif Abdulla Mohammed Al Shamsi, who registered times of 61.08 and 63.95 respectively. The second round – CSIJ-A class – with a total of 37 riders, saw first and second prize go to UAE nationals Omar Abdul Aziz Al Marzooqi and Sultan Majed Al Awani, who completed two faultless rides each. Jumping fences at 1.25m, Al Marzooqi clocked 47.14 in his first round followed by 27.22 in his second, while Al Awani registered 49.61 in his first round and 27.75 in the second. The podium was completed by Jordan’s Mohammad Amjad Al Mommani, who timed his first round at 47.70 and his second at 28.15. The afternoon’s competition began with the third category – the Ladies National Show. 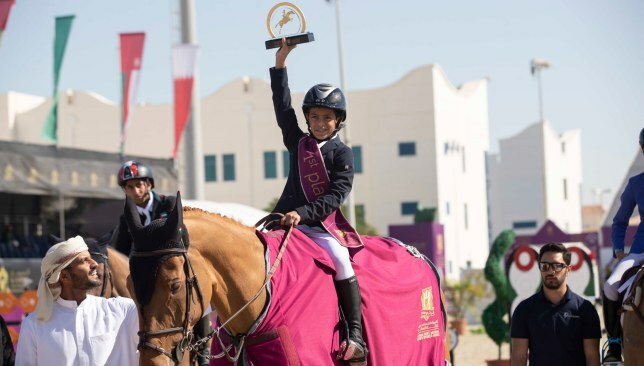 Featuring 62 riders, the top spot was won by Noof Hamdan Al Maheri from Al Hamra Equestrian Centre, followed by Syrian rider Lilac Kojak from Al Ali Stables, and in third spot was Emirati Shaika Fuad Al Midfa, representing Sharjah Women Sports Club. The free event also saw families gather at the ever-popular Equestrian Village, which provides visitors with a fun equestrian-themed activity zone, featuring games and competitions for children of all ages. Godolphin trainer Saeed bin Suroor is looking for a good run from Estihdaaf as he bids to win the UAE 2,000 Guineas for a record seventh time at Meydan on Thursday. Estihdaaf shaped well on his second start in the space of a fortnight last month when staying-on well to get within half a length of the winner Manguzi. As this contest is over a mile compared to nine and a half furlongs last time, Estihdaaf is set to race more prominently. 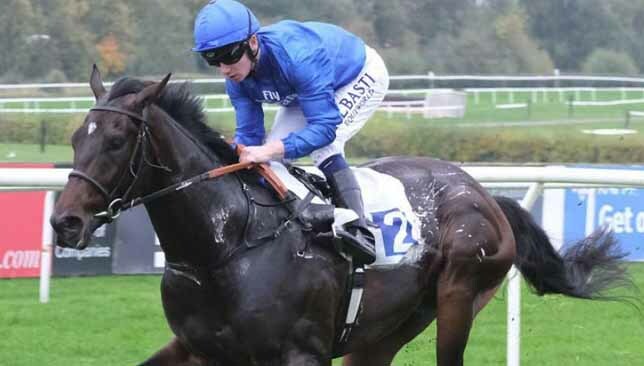 “Estihdaaf finished strongly in the Al Bastakiya Trial and looks to have improved for that run,” he told www.godolphin.com. “I would like to see him race handy in the UAE 2000 Guineas. Simon Crisford, formerly Godolphin’s racing manager, is represented by Sporting Chance, who was third in the Meydan Classic Trial a week ago. North America, impressive winner of round one of the Maktoum Challenge last month, faces just the five rivals in the second round in which Godolphin are without a runner.